Scientists at EPFL have created an optical fiber with the ability to detect the type of liquid or material it has come into contact with. The study has been reported in the Nature Communications journal. In the recent past, optical fibers have served as sensors for detecting variations in temperature, similar to a thermometer, and pressure, similar to an artificial nerve. This method is specifically beneficial for structures such as gas pipelines and bridges. Currently, scientists from EPFL have devised an innovative technique that allows optical fibers to recognize whether they are in contact with a solid or a liquid. This is realized by merely producing a sound wave using a light beam within the fiber. This research was performed by the Group for Fibre Optics (GFO) run by Luc Thévenaz within the School of Engineering. With a width equivalent to a strand of human hair, an optical fiber made of glass transmits light that changes with respect to four parameters: phase, intensity, wavelength, and polarization. 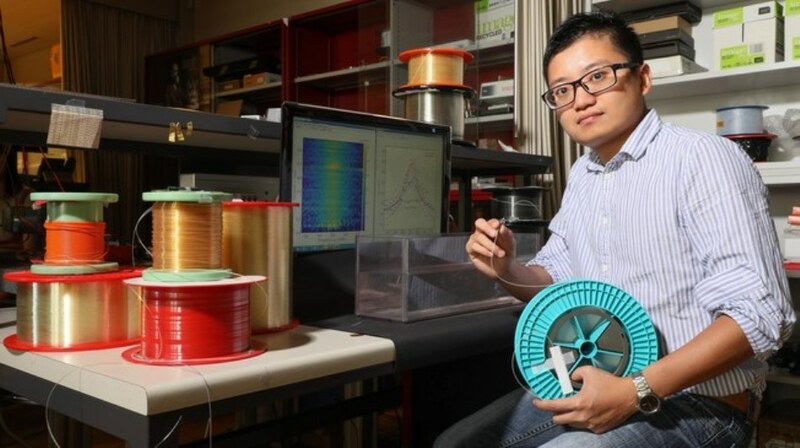 These parameters are modified when the fiber is stretched or if there are variations in the temperature, thereby allowing the fiber to serve as a sensor by detecting abnormal temperatures or cracks in structures. However, to date, it has been challenging to ascertain the processes that take place surrounding the fiber without allowing light to from escape the fiber, which disrupts its path. The technique devised at EPFL uses a sound wave produced inside the fiber, which is a hyper-frequency wave that constantly bounces off the walls of the fiber. This echo differs at distinct locations based on the material with which the wave comes into contact. The echoes leave an imprint on the light. The surroundings of the fiber can be mapped by reading the echoes when the beam exits the fiber. This imprint is very faint that it rarely disturbs the light traveling within the fiber. The technique can be used to sense the processes taking place surrounding a fiber and to send light-based information simultaneously. The scientists have already immersed their fibers in water and subsequently in alcohol, before leaving them out in the open air. Every time, their system was able to correctly identify the variations in the surroundings. “Our technique will make it possible to detect water leakages, as well as the density and salinity of fluids that come into contact with the fiber. There are many potential applications,” stated Thévenaz. The concept of using a sound wave in optical fibers at first came from the group’s collaborators at Bar-Ilan University in Israel. In the future, collaborative research projects are expected to be conducted.